Walking is a low-impact aerobic exercise that's easy to do, requires no special equipment and burns calories effectively. The amount of calories that you'll burn walking depends on how long you walk, how strenuous your walk is and how much you weigh. Walking at a moderate pace is a great way to help you expend calories! 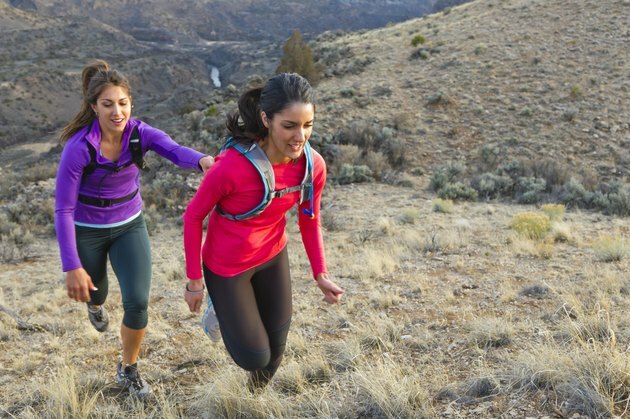 The amount you burn depends on many things, including your body weight and your pace. A 130-pound person burns 177 calories when walking for an hour at 2.5 mph and 224 calories at 3.5 mph. A 155-pound person burns 211 calories when walking for an hour at 2.5 mph and 267 calories at 3.5 mph. A 180-pound person burns 245 calories when walking for an hour at 2.5 mph and 311 calories at 3.5 mph. A 205-pound person burns 279 calories when walking for an hour at 2.5 mph and 354 calories at 3.5 mph. Bumping up the intensity of your walk helps to elevate your workout's difficulty and significantly increases the number of calories you burn off. One easy way to do this is by incorporating elevation, meaning hiking, walking uphills in your neighborhood or setting the treadmill to an incline. Depending on your weight, the route you take and your walking speed, you can expect to burn between 148 and 558 calories walking for an hour. A 130-pound person walking on a flat surface at a speed of 3.5 mph burns 224 calories while they burn 354 calories if walking uphill. A 155-pound person walking on a flat surface at a speed of 3.5 mph burns 267 calories while they burn 422 calories if walking uphill. A 180-pound person walking on a flat surface at a speed of 3.5 mph burns 311 calories while they burn 490 calories if walking uphill. A 205-pound person walking on a flat surface at a speed of 3.5 mph burns 354 calories while they burn 558 calories if walking uphill. To get an estimate of how many calories you burn while walking, start by converting your weight to kilograms. Do this by dividing your weight in pounds by 2.2. Then, multiply this number by the MET value for your activity. This number seeks to quantify the intensity of a workout and varies depending on the type of exercise being performed. A list of MET values is available here. Finally, multiply this figure by the time you walked in hours to get the total number of calories burned. Alternatively, you can wear a fitness tracker or use a calorie tracking app like LIVESTRONG.COM's MyPlate to help you tailor your calculation of how many calories you burn walking for an hour. For either option, you'll input your age, gender, weight and activity level. The fitness tracker relies usually on heart rate and time or distance to figure out your caloric burn while apps rely on the data you report (time and speed or effort) and estimate the caloric burn. 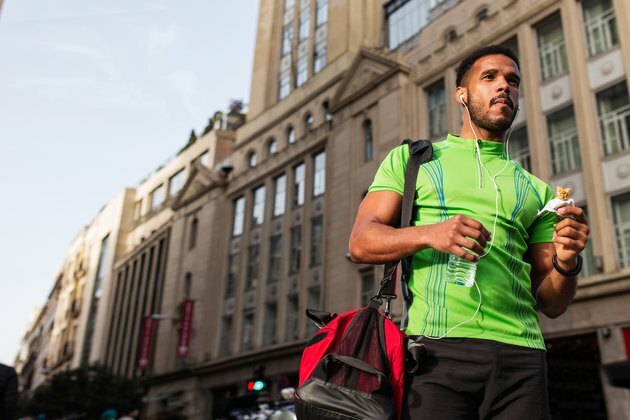 Walking is a fantastic exercise in itself, but here are some easy ways to add a little challenge to your workout and increase the number of calories burnt while walking. Holding hand weights or fastening cuff weights to your ankles while you walk is a great way to increase the difficulty of your routine. Just as a person who weighs more burns more calories when they exercise, adding a few extra pounds makes your walk more challenging. Variety is the spice of life! Switch up your walk by incorporating hills or stairs instead of sticking to relatively level surfaces. Walking on a trail is a good way to integrate natural variations in elevation while burning extra calories at the same time. Interval training can also help you lose weight and burn more calories. This technique mixes in shorter bursts of fast walking with longer periods of walking at a moderate pace. For beginners, start off with 30 seconds of quick walking followed by 2 minutes and 30 seconds at an intermediate pace. Try to complete 5 intervals each time you work out. Using Nordic poles, also known as walking sticks, integrates your upper body into your regimen and helps you burn more calories in the process. They can also help decrease the load that walking places on your knees. To use them, plant the stick into the ground at a 45-degree angle behind you and push into it as you propel yourself forward. Incorporate strength training into your walking routine. Body-weight exercises like squats, lunges or push-ups are a nice way to increase your caloric output while also improving your overall metabolism. For every 5 minutes of walking, try to stop and do 1 minute of strength exercises. Regardless of how many calories you burn, adding walking into your daily routine can have profound health benefits! Going on regular, brisk walks can help you maintain a healthy body weight and stave off diseases like diabetes, heart disease, high cholesterol and hypertension. In addition, regular walking helps improve bone density and leads to increased muscle strength. Frequent walking has also been shown to improve mental health. For example, regular walkers demonstrated improved memory and decreased incidences of depression. They also slept better and experienced less cognitive decline as they aged. To top it off, middle-aged walkers have been found to have longer lifespans than individuals of the same age who don't regularly walk. Clearly, this easy and accessible form of exercise is a worthwhile addition to your daily routine! Healthline: How Many Calories Do You Burn While Walking? How Many Calories Can I Burn Wearing 3 Pound Weights While Walking? What Are the Health Benefits of Walking an Hour a Day on the Treadmill? How Long Does It Take to Burn 100 Calories Walking?